If you skim through my blog, you might notice a common theme. XO Beauty Addict has a very clear-cut niche, which is a resounding passion for makeup. But as a beauty addict, I felt I should expand my horizons a little more to discuss other beauty and fashion related products I have been trying out as well. So when I was chosen by Influenster to review a new line of L'Oreal hair care products, it could not have been a more perfect opportunity. 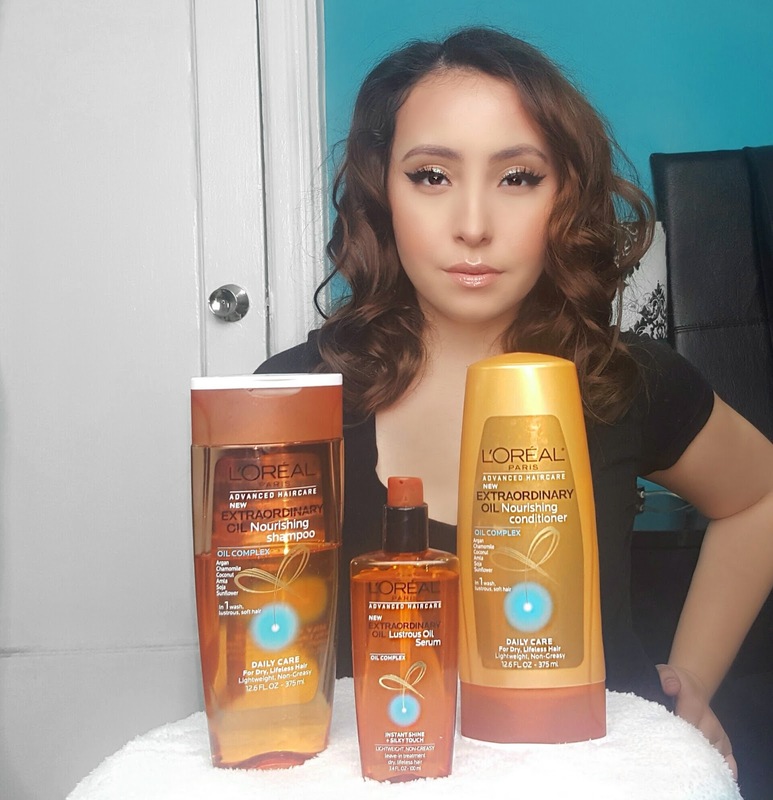 L'Oreal was kind enough to send me three out of four of the products from their new Extraordinary Oil hair care line, which they claim is intended to transform dry, lifeless hair into the soft and lustrous manes we all lust over in television ads. The formula boasts an "Oil Complex" containing Argan, Chamomile, Coconut, Amla, Soja, and Sunflower oils. However, to my oily-scalped friends, do not let that fool you, this formula is anything but greasy. Finding one's holy grail hair products is something I've been conditioned (pardon the pun) to understand would never happen. After trial and error with so many shampoos, conditioners, and treatments, I felt that all hair care was one and the same. They always left my roots oily, my ends dry and damaged, and, worst of all, my hair hung extremely limp. 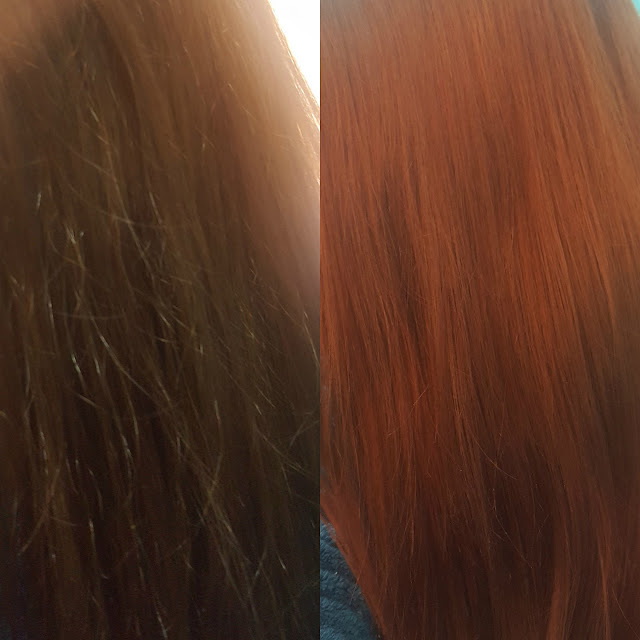 So when I saw immediate results within two uses of the Extraordinary Oil system by L'Oreal, you could say that my hair finally met its match in hair care heaven. After making the awful decision to chop my long, beautiful hair two years ago, my hair has never been the same. I developed the weird dilemma where my roots were flat and greasy after a few hours and my ends were as dry as hay. However, since using the Extraordinary Oil line religiously, I have noticed a drastic change in the look, feel, texture, and overall health of my hair. Two months of use later and I feel like my hair is on its way to becoming its healthy, beautiful self again. It has truly become softer, shinier, and so much more manageable and voluminous. If I could describe this hair care line in any way, I would have to say that it is a simple, yet extremely effective system of products. The Nourishing Shampoo is very silky, which allows it to cleanse your hair, but not strip it of the necessary moisture that it needs. After shampooing I like to take a healthy dollop of the Nourishing Conditioner and slather it on my ends and hair shaft, placing whatever is left over on my roots. To allow my hair to retain the most moisture, I let the conditioner work its magic on my hair for the remainder of my shower. Lastly, I apply the Lustrous Oil Serum to my damp hair. It not only acts as a heat protectant for when I blow dry my hair, it also adds even more softness, shine, and smells amazing. Whereas people used to point out how damaged and noticeable my dead ends were becoming, now I receive an overwhelming amount of requests for hair care recommendations. All I can say is if your hair needs as much of a revival and revamp as mine did, the L'Oreal Extraordinary Oil line will certainly be your best, affordable bet. The line is currently available online and in some drugstores for purchase. Go get you some!